Are you preparing for your biggest race of the year? How do you help your athletes deal with their nerves? How can you help them conquer self-doubt. ? How can we get them it the right mind to perform their best? Everyone has moments of self-doubt, be it a student before an exam or an athlete before they compete. For some, these thoughts are fleeting and quickly pass. For others, like William Shakespeare suggests, they can have a more debilitating effect. So what simple things can you do to manage self-doubt? Is a bit of self-doubt always a bad thing? Self-doubt hasn’t always been found to be a negative thing; in fact, an element of self-doubt may cause people to put in more effort. The relationship between doubt and performance is not a straight line. Over-confidence can be dangerous as it may make you think that not as much effort is needed for the task, resulting in poorer performances. 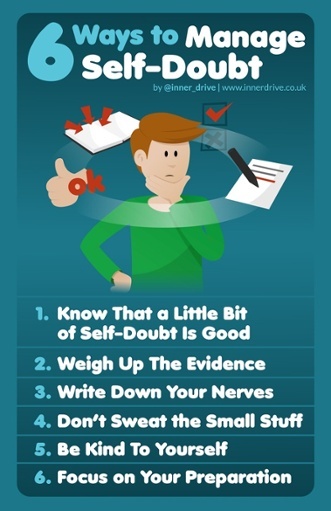 Next time you have moments of doubt, remember that a little bit of self-doubt can actually be beneficial in your learning and performance, especially if it acts as a call to action and results in you putting in more effort. Weighing up the evidence, by challenging how logical and rational your thoughts and doubts are, is a great technique widely used by psychologists. Irrational thoughts can cause an increase in anxiety. That is why it is important to challenge irrational thoughts and doubts. This can be done by firstly recognizing which thoughts are unhelpful and then replacing them with more accurate and helpful ones. We wrote more about challenging unhelpful thoughts in a blog, which can be read here. When individuals become anxious about an upcoming event, these worries can disrupt their focus on the task at hand; however, a solution to this has been found in that simply writing about your worries before an important exam or competition can boost test scores and performance. By getting your worries and intrusive thoughts out on paper, you are addressing, making sense, and eliminating them before you even perform, giving you better focus and attention on the actual upcoming important event. At the time, your worries and doubts make the situation seem far worse than it actually is. Many of us have looked back on an issue a couple of months later, and thought “why did I worry so much about that?” Further down the line, most do not think about, or even remember, the worry at all. So instead of exaggerating your doubts, try to be more realistic and see the concern as a minor obstacle. Trying to see a situation from a different perspective or point of view will help you to understand what is important and what is irrelevant. Psychologists use the term ‘self-compassion’ to explain how well you can comfort and care for yourself when faced with doubt, failure or hard-times. How self-compassionate you are has been found to be a big predictor of how much self-doubt you have. Some tips to improve your self-compassion include being kind to yourself after you fail, recognizing that everyone fails at some stage, focusing on the bigger picture, and acknowledging that it is unreasonable to expect yourself never to make a mistake. To find out a bit more about self-compassion, you can take a quick test here. By focusing on how well you prepare for an event (be it revision before an exam or training before a match), you can strengthen your confidence. The more prepared you are, the more confident you will be. One great technique to encourage preparation is goal-setting. It helps to provide a structured plan for your personal aims, keeps you organised and on track to meet those aims, and increases motivation. You can read how to ensure you are setting goals properly here. In addition, being prepared helps you to stop focusing on the potential negative consequences and things that you cannot control, hence reducing unwanted distractions. Thus it encourages you to concentrate on the present moment and the things you have control over, leading to more positive outcomes. Self-doubt doesn’t need to be a traitor that snatches defeat from the jaws of victory. A little bit of doubt can help you perform better. If those doubts get too much, then weigh up the evidence, write out your nerves, don’t sweat the small stuff, be kind to yourself, and focus on your preparation.